Angels are fascinating to us humans. We may have different ideas of what angels looks like, and what their purpose is, but we can all agree that angels are beautiful, Heavenly beings created by God. What do angels do all day? Should we pray to angels? Will we become angels when we die? 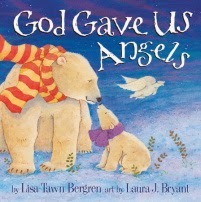 Aimed at children ages 3-8, this book is a good foundation for teaching little ones about God's special messengers. The book is a great educational tool. The only thing I think it could use is some Scriptural references for parents to look up and read. For example, on one page of the book it says "we should be nice to everyone we meet, because some might be angels in disguise." It would be good to have Hebrews 13:2 listed at the bottom of the page, or referenced in the back of the book, as the verse shares where this information can be found in God's Word. Other than that, I love the book and would definitely recommend it. NOTE: I received a copy of this book from Blogging for Books for the purpose of this review. CHRISTMAS HYMN: Who Is He in Yonder Stall? CHRISTMAS HYMN: What Child Is This?